Bits and pieces of the house are undergoing transformation. I don't have a lot of time to do things and, lately, my stamina has been suspect, so I look for small projects which accomplish a couple of goals. 1) They make a section of the house whimsical or more enchanting and 2) They help me continue on the long journey of tidying up. Last month, I did another small corner. This is the end of the hallway. To the right is the back bedroom. To the left is my bedroom. On the wall to the right are photo collage frames containing a wide variety of photos of my life; both family, alive and deceased, and friends, alive and deceased. Above the chair is framed The Simpson's "Wanted" poster from TV Guide from the two part "Who Shot Mr. Burns" episodes of 1995. 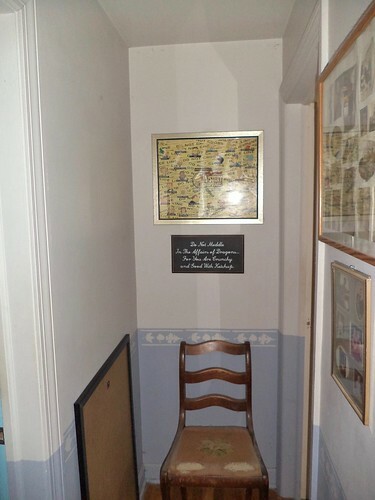 Below that is a plaque which reads, "Do not meddle in the affairs of dragons for you are crunchy and good with ketchup." The chair was owned by my mother's father. His third wife did the needlepoint chair seat. It is very worn and I think, some day, I'll have the seat recovered. In my fantasy life, I actually do the needlepoint for the seat but reality usually points out that I don't know how to needlepoint. On the left used to be a drawing of a sunflower. I did it years and years ago, when life wasn't sunny. It was to remind me to turn and follow the sun; follow the light; be open to the light. For the last few years, that's felt rather 'new agey' to me and I've wanted to replace the piece, but didn't know what to put there. So, this corner was ripe for a minor redo. 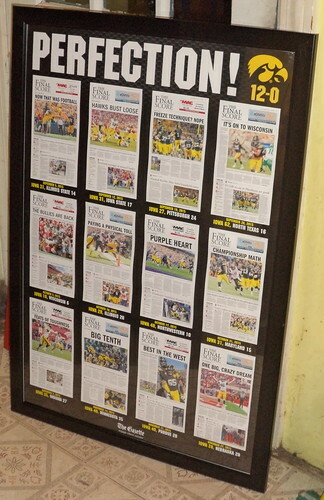 In the winter, I ordered a poster which featured the cover images of the Cedar Rapids Gazette's coverage of the Iowa Hawkeyes 12-0 Big Ten football season last year. I got a frame for it and took it to the office, intending to put it up on the wall next to the Fantasia poster for which I did a frame make over. Fantasia is the only thing I want on this wall. 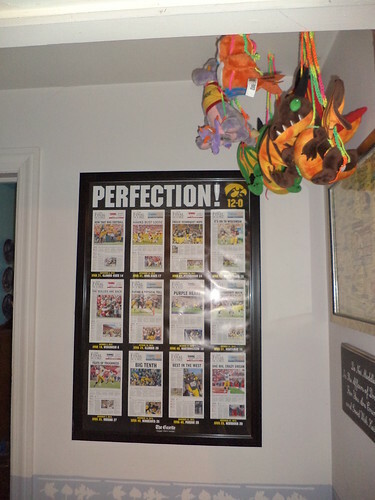 The Hawkeye poster would go on the right wall, above the bookcase. The more I looked at the poster, as it leaned against the wall, the more I realized I didn't like it over the bookcase. 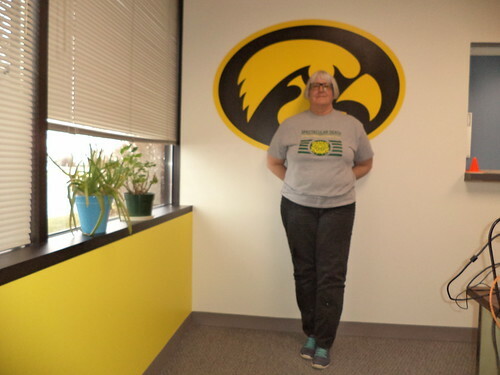 I moved it to the wall where the large Hawkeye wall decal is. But I wound up not liking it here either because it's big. The other side of the pass-through window doesn't have enough space unless I want to hide the poster behind the office door. I never close my office door. I have no reason to close it. The poster came home. Maybe I can...wait...it can go on the wall in that spot where I'm removing the drawing. That's what's up against the wall on the left, in the top photo, the framed poster. The best thing I did to this corner involved some stuffed animals. I got the little orange bird, named "Pepe", and the black and red dragons back when I went to BlizzCon last year. Dragons feature in World of Warcraft extensively. 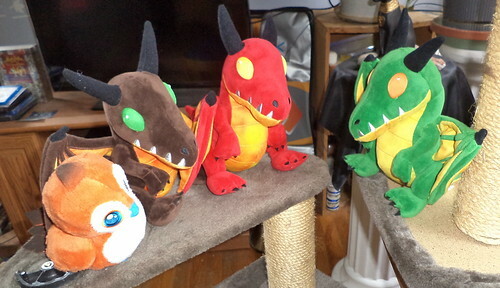 These represent baby dragons, called "whelplings". Essentially, the stuffed animals just sit around. I don't do anything with them, other than move them because where they are sitting is in my way. Blizzard released the green dragon in April and, well, there are some things one simply must have. That means I have to move all four of them around when I need the spot where they were sitting. Such a pain. Then, I had a singular idea. They are flying creatures. What if I had them fly? 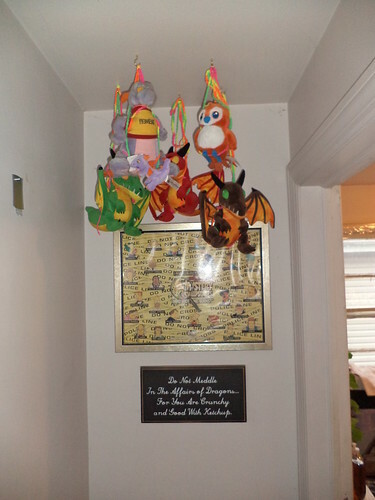 I bought some neon bright variegated yarn and crocheted a thread for each dragon, Pepe, and Figment, a dragon I got from Walt Disney World back in 1990. I bought cup hooks and screwed those into the ceiling. The thread was looped around each character and then tied to the cup hook in the ceiling. Viola. Instant flying bird and dragons. Now, the plaster ceiling holds the cup hooks, but I was surprised they didn't screw in as tightly as I would prefer. Right now, nothing's fallen, but I kind of expect one of these guys to wind up on the floor if we have a really windy day and the windows are open. At that point, I'll have to evaluate this arrangement and consider how else to anchor them. 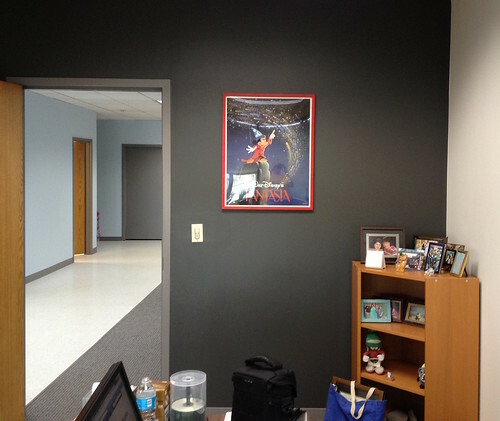 The poster went up on the wall. You can see the hanger to the left in the above photo. I'm very pleased with the overall result. The drawing wasn't applicable to me anymore and these items reflect who I am.